Famous for its impressive mountains and spectacular mountain views, The Northwest tour Vietnam, is the ideal place to visit if you are passionate about off-road adventure and motorbike travelling. A trip to Northwest Vietnam could easily become the best lifelong experience you have ever had while meeting the world on wheels! As you leave Hanoi and head north to Hong Son Lake, take a few moments to enjoy the amazing scenery along the river. The beautiful surrounding with small iconic islands lying in the heart of evergreen forests and the endless limestone peaks comprise an idyllic scenery of unparalleled beauty not to be missed. The landscape becomes even more inviting as you head up north and reach the flat, smooth road. At around afternoon, we arrive at Maichau and walk around exploring the town, just before dinner time. The day ends with traditional Thai Dance music shows that you could choose to attend and enjoy a relaxing and fun closure of the day before you bed down at your selected Thai stilt house. This is the day during the tour vietnam when you ride the short dirt road and leave Mai Chau, heading west of the Da River. The scenery has lots to offer yet once again with enchanting caves and numerous stripped stone pieces and stone axes ready to be discovered. Then, we use the ferry to cross the lake, and, on the other side, there lies a challenging mountain ride. You can reach the very tops of the high-peak mountain ranges that spread in front of you, as you have the wild river as your guide to your left. Have some lunch at Bac Yen, before you continue north alongside the banks of the river and finally reach your 2nd-day destination, Son La, to have an overnight stay at the hotel. With a tributary of the Black River on the right, we drive upstream, on a dirt road, go passed a magnificent green forest and introduce ourselves to the forgotten in time pockets of Thai, Tay, Man and H’among, meet its friendly people and win our way to the Lai Chau plain, with astonishing limestone-karst topography. Not far from Sin Ho, you have the chance to help the local economy by purchasing handmade products that you will find in Mang village. As for overnight stay, the day includes a nice night in a hotel in Lai Chau. With mesmerizing primordial landscapes with profound wild beauty, and a short, yet amazing, ride to the pass of O Quy Ho and Hoang Lien Son, you will come face to face with one-of-a-kind, heart-stopping, and most virgin lands on the face of the Earth! Dare to take the challenge? Let us ride over 2,000 meters above sea level and go passed an all-year cloudy cover pass; the highest you can get in Vietnam. As you ascent, make sure you remain your focus on the road, as the jaw-dropping views will probably steal your heart and…attention! 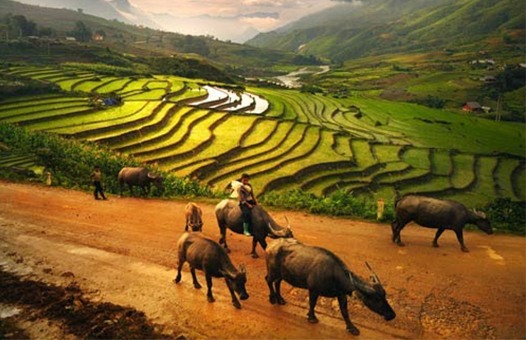 Our next stop is at Sapa, a beautiful tourist attraction that has gained elevated interest by more and more people that want to a once-in-a-lifetime experience. This is also where we would stop for the night and sleep in a hotel before the final 100 km of our trip. What do you think of Motorbike Adventure Northwest Vietnam / 6 Days?